Tours run daily in either the morning at 8.30am or 9am or the afternoon at 3pm. Visit Toledo off-season to enjoy less-crowded streets. Generally the morning tour sees less crowded streets than the afternoon tour. We are comparing Toledo Half-Day Tour from Madrid Prices from leading ticket suppliers and Try to find you Cheap tickets prices on the market. 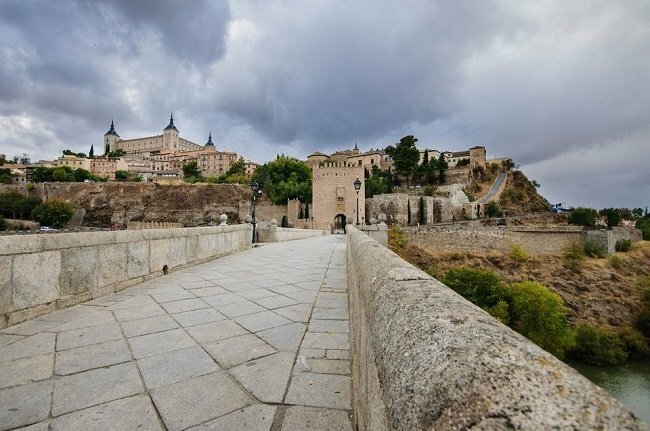 Located 70km from Madrid, Toledo is a beautiful medieval city that has been awarded a UNESCO World Heritage status and is one of the oldest places in Europe. The walled city contains picturesque narrow streets, a beautiful Gothic cathedral and historic churches, synagogues and monasteries. Rich in artistic and architectural heritage it is considered a city of 3 cultures: Christian, Moslem and Jewish people all lived here. Toledo boasts architecture from almost all periods of Spanish history - Arabian, Gothic, Mudéjar, Renaissance and Baroque style and was the home of the famous painter El Greco. With your bilingual guide you will be able to explore this historic city and learn about its history as you visit some of the most important sites on your half-day tour. A convenient way to discover a popular tourist destination outside of Madrid. The half-day tour with guide provides a satisfactory introduction to Toledo – Great if you want a hassle-free tour with an English speaking guide to tell you the history and show you all the key locations. Great if you're super short on time and cannot do the full-day tour. A must-see destination for people who love history and architecture. There is a lot of walking so make sure you're able to keep up with the group. Your Experience With Toledo Half-Day Tour from Madrid ? Depart Madrid on a 5 hour / half-day trip to the historic city of Toledo. Travelling by air-conditioned coah on either a morning or an afternoon tour you will have the opportunity to learn all about this medieval UNESCO city with your bilingual (Spanish and English) guide. Visit some of Toledo's top attractions on a walking tour of the city. View the exterior of the beautiful cathedral, see El Greco's famous painting 'The Burial Of Count Orgaz inside the Church of St. Tomé. Tour the Santa Maria la Blanca Synagogue and view the beautiful architecture inside the San Juan de los Reyes monastery. Walk the streets of the Jewish Quarter as your guide informs you about the history of this 'city of 3 cultures' and walk past the old Palace of Justice and the City Hall plus other historically important sites. You will also learn about damascene; the famous technique of encrusting precious metals in steel, stopping off at a factory workshop for a live demonstration. It's then time to get back on to the bus to enjoy a panoramic sightseeing tour of Toledo's outer walls and wonderful scenery with a stop at The Mirador del Valle viewing point for photo opportunities before heading back to Madrid. What Toledo Half-Day Tour from Madrid Includes? Return transport by air-conditioned coach from Madrid to Toledo. A bilingual guide (Spanish and English) will accompany you on the coach as well as on the tour of Toledo to inform you of this stunning city's history. Guided walking tour of Toledo including the Jewish Quarter, past the cathedral, past the city hall and other important sites. Fast-track entrance fee is included for the Church of St. Tomé and the Santa María la Blanca' Synagogue with the added option of going into the San Juan de los Reyes' Monastery. Demonstration of damascene (incrustation of precious metals in steel) at a factory workshop. Panoramic bus tour with photo opportunities around the outskirts of Toledo. Due to the short amount of time there is no time to explore the city on your own and no scheduled time to buy souvenirs. Pack drinks and snacks because you won't have much time to stop for refreshments within the city. Travelers Reviews about Toledo Half-Day Tour from Madrid ? Visitors talking about this tour on Viator and Getyourguide are, over all, very happy with the half-day tour, though most people do wish they had booked the full-day tour to give them more time to fully enjoy the stunning city! There have been a few reports of unengaged guides speaking from rote or forgetting to speak in English when faced with mostly Spanish tourists on the trip, but the majority of people say their tour was well organised and their guide was very informative, friendly and spoke great English. Get instant booking confirmation via email when you book online. Printed tickets or e-tickets are accepted. Wear comfy shoes and check the weather forecast to make sure you have the right clothes with you. Infants travel free with an adult providing they do not occupy an extra seat. Meeting point varies depending on which tour company you book through but all meet from a central Madrid location, and some offer hotel pickup.